Given our disenchantment with the march of tourists to every imaginable weekend destination close to Delhi, our plan for a family break seemed to be facing all too many challenges. The most prominent was the willingness to travel no more than 200km from the Capital. We wanted to get past the traffic-choked roads of Delhi soon and reach the destination in less than 4 hours. 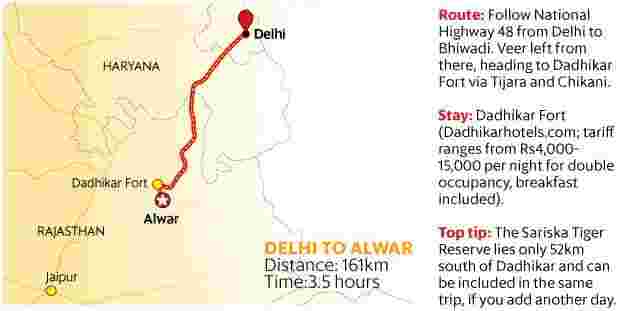 After much foraging for information, we decided to head to Dadhikar Fort in Alwar. We took the Gurugram-Manesar-Jaipur road and the breathtaking Aravallis held sway once we crossed the traffic snarls in industrial areas. It was almost noon when we reached our destination. The air was balmy and the surroundings serene, a great change from the polluted Delhi skies. We checked in at the heritage-themed hotel attached to the fort. The hotel staff recommended a meandering road to another fort, about 12km from Dadhikar. A silvery strip of tar wended its way through the hills to Alwar Fort, or Bala Quila. Built by the 16th century ruler Hasan Khan Mewati, the fort stands amid a forest. This forest, protected by a high wall, comprises mainly dhok trees, which are common in the region. Though the fort itself bears signs of neglect, we could still appreciate the architecture—primarily, the towers lined on a ridge. We tried to ignore the graffiti on the walls of this once majestic fort, which looks down at the city of Alwar. Since we had time, visiting Siliserh Lake, 21km from Bala Quila, seemed like the ideal way to end the day. The lake is a stunning oasis in the midst of the pale browns of the Aravallis. A palace, now a heritage hotel, stands at the edge of the water. In 1848, maharaja Vinay Singh of Alwar constructed both the palace and the reservoir for his wife Sila. Motor-boats in the lake whirred in the distance— we chose to watch them from the palace. That night at Dadhikar, an old waiter narrated the story of the fort. The ninth century Chand dynasty built Dadhikar Fort as a residential palace after it lost everything to floods in its capital, Abhaneri. Later, these rulers moved to Bala Quila, converting Dadhikar into a military camp. In 2007, Ram Kaushik, an agriculturist from Alwar, bought the dilapidated fort and restored it; today, its well-appointed rooms offer modern amenities. On Sunday, we decided to explore Bhangarh, supposedly the haunted ruins of a 16th century township. Bhangarh lies almost 100km south of Dadhikar, but it is a comfortable drive. This was the capital of Madho Singh, diwan in the court of Mughal emperor Akbar. As we entered, we saw a Hanuman temple and the ruins of Jauhari Bazaar. Several temples, like the Gopinath and Mangla Devi temples, all built in the Nagara style, dot the sprawling grounds. The royal palace is right at the end. The township had three successive entrances: Lahori Gate, Ajmeri Gate and Delhi Gate. They still look grand, almost as if trying to shrug off the condition they find themselves in. In the daytime, there was a not a trace of legitimacy to Bhangarh’s label of being “the most haunted destination of India". The gatekeeper, however, claimed he had witnessed paranormal activities, and that visitors were only allowed uptil sunset. Averse to any apparitions tarnishing what had been a perfect weekend, I nudged our group into leaving. After all, we had to drive all the way to Delhi. Weekend Vacations offers suggestions on getaways that allow for short breaks from metros. The author tweets from @abhaiyengar.